I know there are elf on the shelf photos floating all around the internet these days and I’m just going to add to the madness by sharing a few more. Camille sent me pictures of her elf as well, so we have a fun compilation of elf pictures to choose from. I know sometimes it can be hard to come up with ideas for your elf so you are welcome to use any of them, pin them, make fun of them, or ignore them. Whatever you choose. If you like these check out our other elf on the shelf posts. Have you ever forgotten to move your elf!? Check out what to do. Feeling overwhelmed by your elf? Check out some advice and tips here. Now on to our week with Streamer! 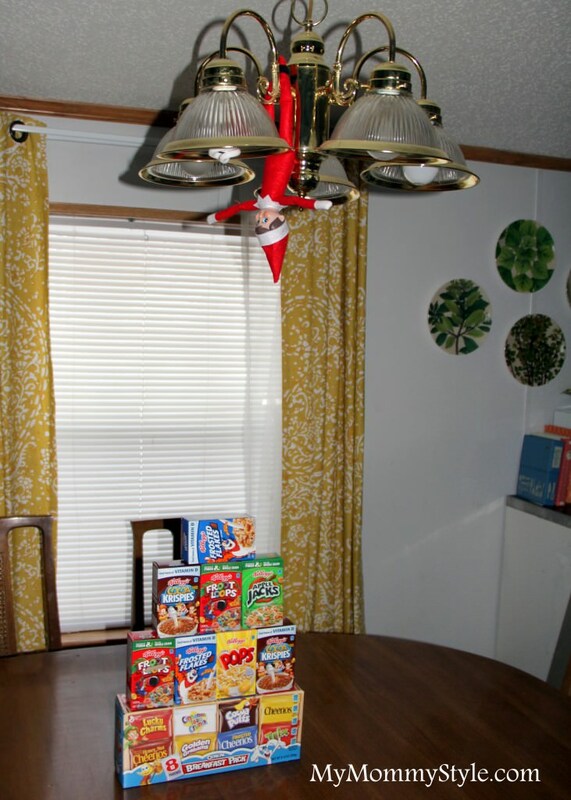 Our acrobat elf brought a pyramid of sugar cereal . Sugary cereal is a special treat for us and something they know is only for special days so they were extra excited. Streamer had some help from some of the other toys making an awesome fort in the front room. This kept them entertained and happy all day. Oh no! Streamer was captured by a bunch of nutcrackers. They hid up on top of the cabinets in the kitchen to make it a little trickier to be found. Streamer flew in with a Christmas movie. Silly Streamer made a disguise with an eye patch, mustache, and an argyle sweater (an old church sock with a hole in it!) He was checking himself out in a mirror. We’re renting a house right now that is smaller than the house we were living in last year. It does make it a little harder for me to come up with places to hide Streamer. Today I decided to put him on the washing machine, which ended up being pretty hard for the kids to find, but they loved it. Streamer brought sugar cookies, frosting, and sprinkles. If I had thought of it I would have had Streamer decorate a cookie. Here is what Camille’s elf has been up to lately. All of the flying back and forth to the North Pole can make an elf pretty thirsty. Decorating a small Christmas tree. Fishing for fish crackers in the bathroom sink. Maybe he was feeling home sick for the North Pole? They found their elf in the freezer (with a scarf, of course). Good luck with your elves! What are your favorite things your elf has done? Also, don’t forget to check out our NEW Elf on the Shelf + Frozen eBook for more great ideas!